One of our favorite things about summer is barbequing. The grill certainly isn’t just for meats! Farm fresh produce also tastes great when cooked on the grill. 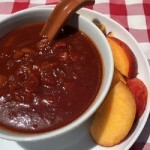 The next time you entertain, consider making one of these tasty summer dishes, recipes courtesy of Carolyn’s Farm Kitchen (http://www.carolynsfarmkitchen.com/)! Heat the oil in a large saucepan and add the onion and garlic. Cook over medium heat for 5 minutes until translucent. Add all of the remaining ingredients except the salt, and simmer over low heat until reduced and thickened, 35-45 minutes. Blend in the salt, simmer another 2 minutes and taste for seasoning. Leave sauce chunky or puree if desired, and store in the refrigerator for up to 3 weeks. Pre-heat a grill to very high. Dip the cut surface of fruit into sugar and place on the hot grill for 1-2 minutes or until the sugar has caramelized and grill marks appear but peaches remain firm. Remove from grill and cool. At this point the peaches can be sliced and used in salads or salsas, or left whole and filled with vanilla ice cream for dessert. Variations: apricots, plums, & nectarines! Toss all ingredients together and let sit for 30 minutes. Serve with tortilla chips or as a salsa for grilled fish or meats. Preheat the oven to 400. Melt the butter in a large sauté pan and cook the corn and onion over medium-high heat just until softened, about 4 minutes. Add the minced chiles and cook another minute. Remove from the heat and set aside to cool a bit. In a large bowl combine the cornmeal, salt, black pepper, baking powder, and baking soda and blend thoroughly. Separately, whisk together the eggs and buttermilk and add this to the dry ingredients stirring just until blended. Add the corn and onion mixture to the batter along with the cheddar cheese, and blend gently. Transfer the mixture to a greased shallow baking dish and bake for 25-30 minutes or until the center is set and top golden brown. Remove from the oven and serve warm. Variations: other ingredients can be added to this including herbs, sweet peppers, chipotle peppers, or pepperjack cheese.